Thinning hair and baldness is a cosmetic problem that affects both men and women. Although it is not physically debilitating, hair loss can take a toll on your appearance and have a detrimental effect on your self-esteem. Fortunately, men and women no longer must live with hair loss. Regenerative medicine provides cutting-edge treatments to restore natural hair growth without surgery. 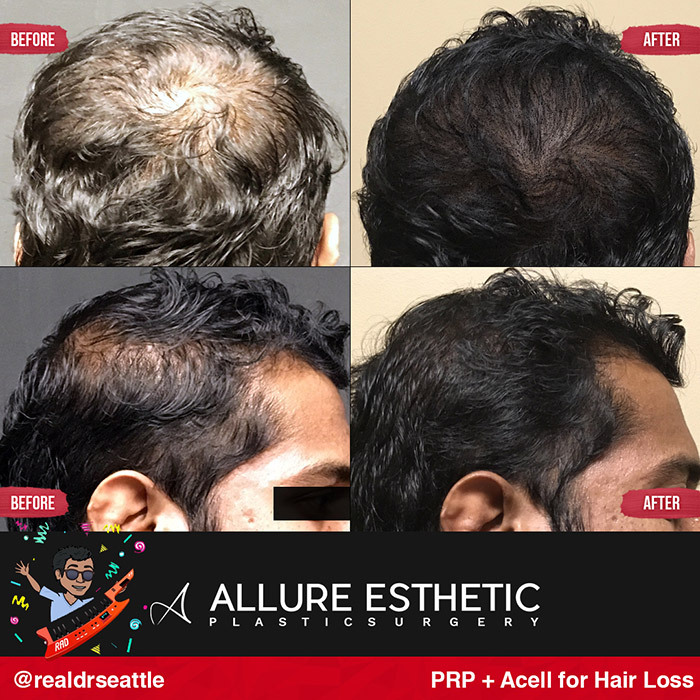 Dr. Javad Sajan at Allure Esthetic Plastic Surgery performs PRP + ACell treatment in Seattle. Combining platelet-rich plasma (PRP) and ACell treatments has proved to be more effective for treating hair loss than PRP treatments alone. This combination therapy has been shown to spur the growth of healthy hair in areas where it has been reduced or lost. What Is PRP + ACell Therapy? PRP + ACell therapy is a hair loss treatment in which two therapies are combined to produce better results for reversing hair loss. PRP is a substance that is prepared from your own blood. Our blood is liquid plasma containing red and white cells and platelets – small disc-shaped cells with hundreds of proteins called growth factors and other regenerative molecules that stimulate the process of healing. To prepare PRP for injection into your scalp, Dr. Sajan will draw a small amount of blood from you and spin some of that blood in a centrifuge to separate the platelets from the other components. Those platelets are then added to the remaining blood to produce platelet-rich plasma for injection into the treatment areas of the scalp. PRP is a completely natural treatment that is widely used in regenerative medicine to treat a number of conditions, including thinning hair and hair loss. ACell is a proprietary, regenerative medical product that has many surgical and medical uses. It is manufactured using tissue from pig bladders and has a chemical structure similar to human tissue. This product is manufactured in the form of a fine powder or in solid sheets. For surgical and medical uses, ACell forms a scaffold in which healing can occur. It recruits different cells to the site of the injury and triggers the formation of new blood vessels. As the patient heals, the scaffold degrades and is reabsorbed into the body. For treatment of hair loss, ACell can be applied to the scalp on its own or, more typically, injected into the scalp in combination with PRP. In this procedure, PRP and ACell are combined and injected into the scalp to promote more robust new hair growth and to encourage miniaturized hair follicles to become larger and healthier. The treatment takes 1 to 2 hours, after which you can resume normal activities immediately. First, Dr. Sajan takes a blood sample and prepares the PRP. Next, a topical anesthetic is applied to numb the treatment area of the scalp. Then the PRP and ACell are combined and administered in a series of injections using a tiny needle. You may experience some tenderness and tightness of the scalp for a few days after treatment. PRP + ACell therapy helps prevent treated hair follicles from miniaturizing and helps reverse the process in follicles that have already begun to decline. New hair growth can be seen as early as 1 to 3 months after PRP + ACell therapy, and usually within 4 to 8 months. Hair may continue to improve for up to 1 year after treatment. While for some patients a single treatment is sufficient, others may need a second series of injections approximately 6 months after the first series. For best results, Dr. Sajan recommends treatment once a year. Hair loss is a serious cosmetic concern for many people. State-of-the-art regenerative treatments are now available, making it possible to keep more of your natural hair on your head. Dr. Javad Sajan at Allure Esthetic Plastic Surgery is a respected Seattle plastic surgeon with extensive experience in hair restoration. If you are experiencing hair loss or thinning, call our office to schedule a consultation with Dr. Sajan. He will listen to your treatment goals, evaluate your scalp, and tell you if PRP + ACell therapy is the recommended hair loss treatment option for you.